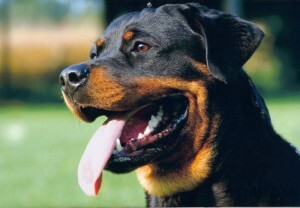 Rottweiler Breed Inormation " "
Rottweilers, often called Rotties, are a courageous and devoted breed. Their temperament is known to be very reliable, and they have proven to be quiet trainable. The Rottweiler is prized for its natural abilities as a guard dog, as he isn’t afraid to protect his family with fierce force. The Rottie loves his family and does not mind the company of children or other household pets. When he is brought up with the proper care and training, he is a fantastic and affectionate companion. However, due to their high need for socialization, companionship and consistent training, Rottweilers do not make ideal pets for first time dog owners. Rottweilers are believed to be the descendants of mastiff-type dogs known as drover dogs that were popular in ancient Rome. The term “Rottweiler” actually translates to “rotten and vile”. However, Rotties were not named for the meaning, as the breed originated in the town Rottweil which is now apart of southern Germany. During the mid 19 th century the cattle trade thrived in Rottweil, and so did the Rottweiler Metzgerhund. The dog was used to drive cattle to the market for their masters, and returned to their owners with filled purses around their necks. As time passed and trains became the primary method of trading cattle, Rottweilers were used less and less often. Although Rotties were recognized by the American Kennel Club in the 1930’s, the breed didn’t actually become popular in the U.S. until the 1980’s. Today they are one of the AKC’s top five most poplar dog breeds. Rottweilers are large dogs that reach an average height of 24 – 27 inches and weigh anywhere from 95-130 pounds. 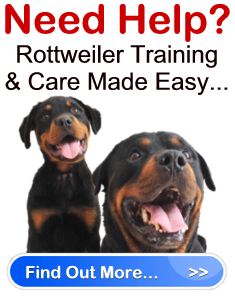 The Rottie is recognized as being part of the Mastiff or Working dog group and usually lives 10-12 years. They are a relatively healthy breed but are prone to hip dysplasia, entropion, and torn ACL (Anterior Cruciate Ligment), which is a health condition concerning the knee joint of the dog. Believe it or not, Rottweilers make excellent family dogs and are affectionate to just about everyone. When properly socialized, and treated well from a young age, this also includes children and other family pets. They are wonderful guard dogs and are extremely calm and alert. They usually tend to follow their owners around the home and keep a careful watch over their loved ones. The Rottweiler requires serious obedience training. They must be well socialized and consistently trained from puppyhood. If you do not train this breed, they can become extremely aggressive towards others and be hard to control. This is a danger you will want to avoid. Rottweilers do need plenty of exercise, but they are quite inactive when indoors. Therefore, if they are provided with sufficient exercise (IE. at least two 20 minute walks a day plus the freedom to run), they will be fine living in an apartment. Other exercises that are great for this breed, and which they will greatly enjoy, include swimming, fetch and running along side a bike. Rotties are easy to groom and require a good brushing once every week or biweekly. You can bathe the dog on occasion (usually twice a year). Rottweilers are average shedders. There is more to Rottweilers than meets the eye. The Rottweiler is a beautiful breed that does make an excellent companion when properly suited to the right owner. You should never consider owning a Rottie unless you have done extensive research on the dog, and are committed to training and teaching him to be a well loved member of your family and community.